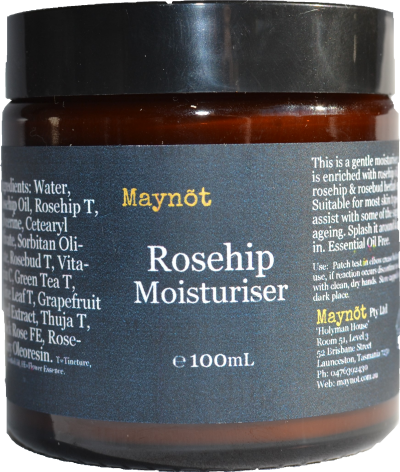 This is a gentle moisturiser, which is enriched with rosehip oil, rosehip & rosebud herbal extracts. Suitable for most skin types, may assist with some of the signs of ageing. Splash it around & rub it in. Essential Oil Free. Ingredients: Water, Rosehip Oil, Rosehip T, Glycerine, Cetearyl Olivate, Sorbitan Olivate, Rosebud T, Vitamin C, Green Tea T, Olive Leaf T, Grapefruit Seed Extract, Thuja T, Rock Rose FE, Rosemary Oleoresin. T=Tincture, EO=Essential Oil, FE=Flower Essence.